In the previous post to this blog we took a quick look at the “Save game” dialogue in Fritz and Rybka (which also applies to ChessBase 11, by the way). I didn’t mention the ability to include extended (and fairly specific) information about the tournament in which a particular game was played. 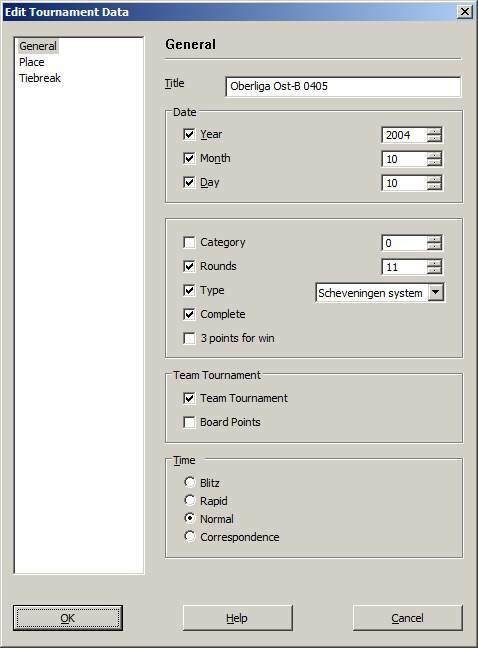 So let’s zero in on that facet of game entry in ChessBase as well as the related playing programs). There are actually three separate dialogues here, the most important of which are “General” and “Place”. These dialogues allow you to enter very specific and detailed tournament information (which could never fit in the limited space provided in the regular “Tournament” field). The illustration shows the fields provided when you select “General” from the left-hand pane. Much of this information, like “Date” and “Team Tournament” is self-explanatory. “Time” should also be easy to figure out, but there’s an interesting aspect to this toggle which can affect your future searches. 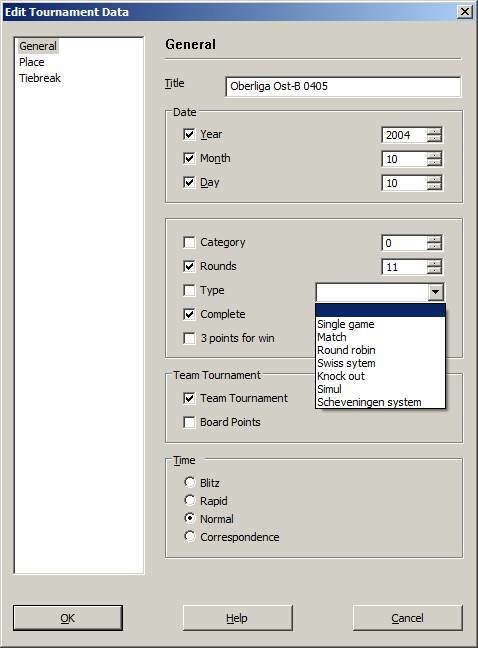 ChessBase has recently introduced a new search toggle called “Good games” which excludes blitz games (among other criteria) from database search results. Selecting the “Blitz” radio button here marks the game as having been played at blitz time controls; the game will be excluded from searches performed with the “Good games” toggle switched “on”. Complete – used to signal that all games from the tournament are complete (not partial games) and all are available in the database. Category – denotes the FIDE rating category for the event. Rounds – the total number of rounds in the event. This, along with “Complete” are important for proper crosstable generation in the ChessBase software. “3 points for win” is another important toggle. The “soccer” scoring system of awarding three points for a win and a single point for a draw is gaining increasing traction and popularity as an “anti-drawing” device in top-level play. This is another important toggle for proper crosstable generation in ChessBase. You can simply click on your selection from the list which is provided. 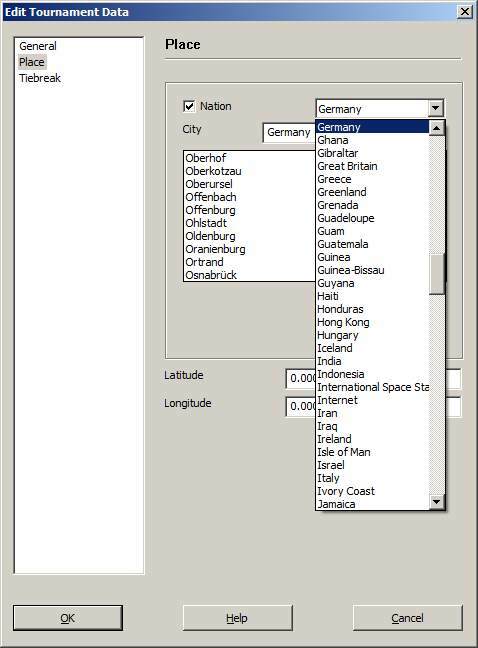 After selecting a country, you can choose from a pre-selected list of cities or else just type a location in the box. If you know the latitude and longitude of the site, you can enter that as well. 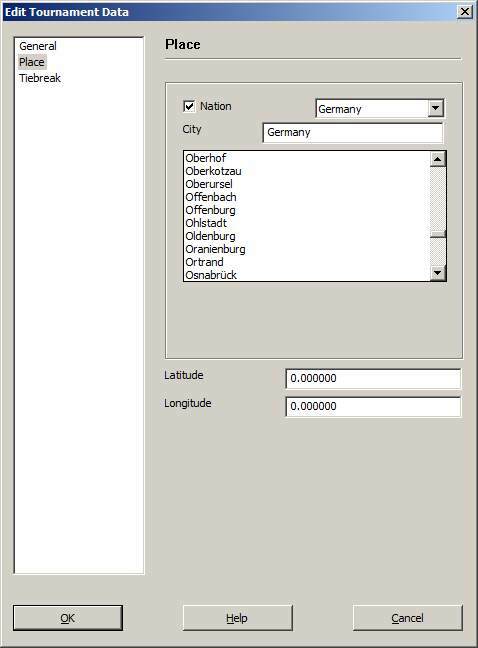 (Entering coordinates in this field isn’t necessary, but is certainly interesting, and I rather suspect that future versions of ChessBase may include a global display to show exact tournament locations with “Google Earth”-like precision). When you’re finished, just click “OK” and you’ll be returned to the main Save/Replace Game dialogue as seen in the first illustration above. Finish filling out the game information and then click “OK” to complete the process of saving or replacing the game. USCF Sales carries the full range of ChessBase and Fritz chess software!